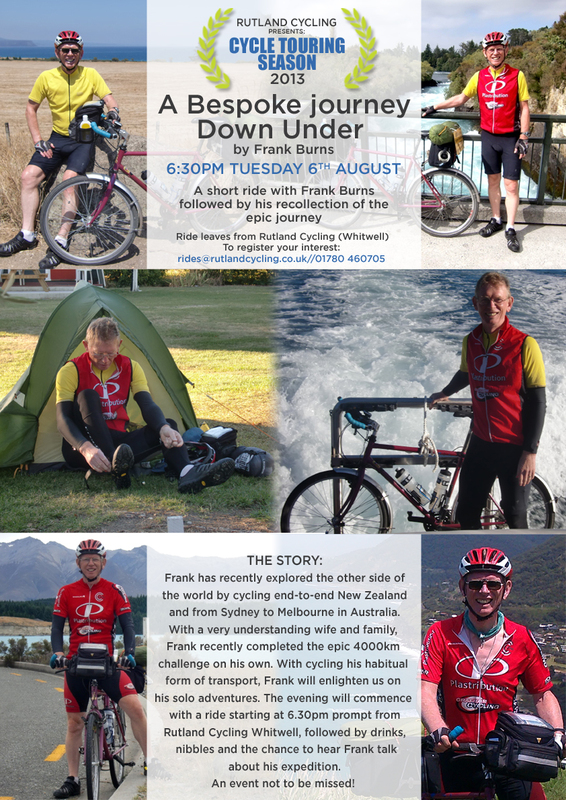 I did a presentation of my Bespoke journey Down Under at Grafham Cycling a few weeks ago, and they liked it enough to invite me to do a repeat, but this time in their branch at Rutland Cycling, Whitwell Carpark. If you live within striking distance, do come and join us. There will be free nibbles and drinks, a short ride around the reservoir at 6.30pm, followed by the presentation at 8pm on Tuesday August 6th. We had a great turn-out at the first presentation of “A Bespoke journey Down Under”, and over £200 given as donations to the Syrian Appeal…..gently nudging our current total up to £7,700. If you missed it and would like a second chance to see it, come along to Grafham Cycling, Marlow Car Park on Monday May 20th at 8pm. Free admission and refreshments served. 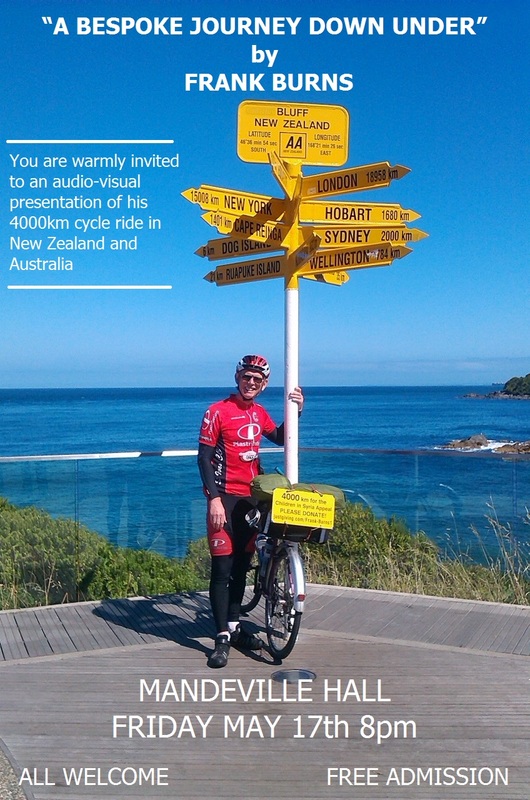 For the keen cyclist, you could also join a group ride around the water, from 6.30pm. 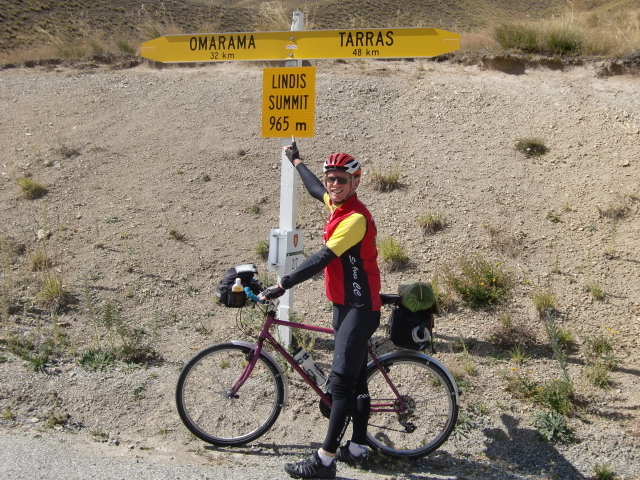 Have a bit of fun and exercise, then settle down to hear about the thrills and spills on my ride in the Antipodes. If you are free, and live locally, do come and join us. Steve and Frank finally meet! 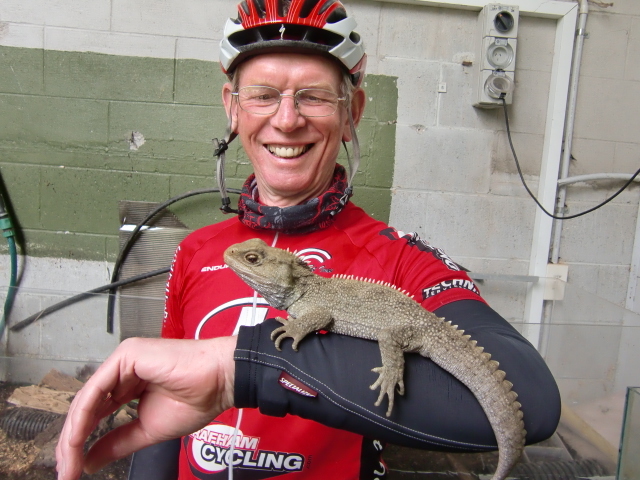 Steve Wesson and I met on the internet, through our respective blogs, and discovered we were doing the same (or similar) route through NZ. 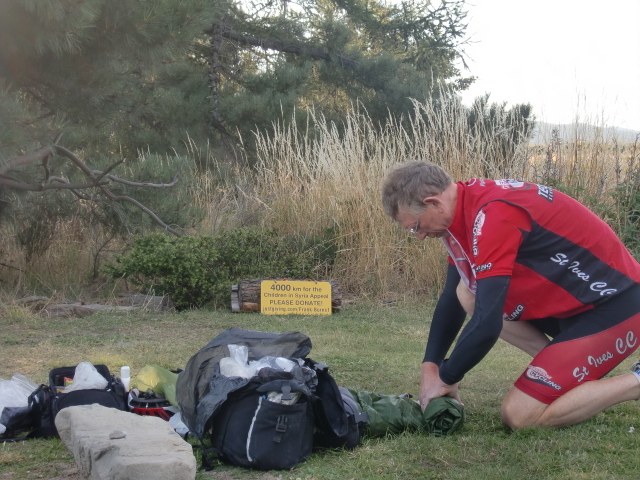 He set off a couple of weeks after me, set himself the challenge of doing the most direct route in the shortest time possible, and hoped to catch me in Bluff before I flew out. 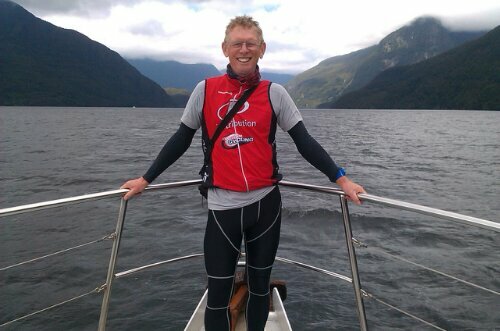 Well to cut a long story short, Steve did have a few challenges on the way, didn’t manage to complete the whole distance, but still did cover a huge mileage in the time. 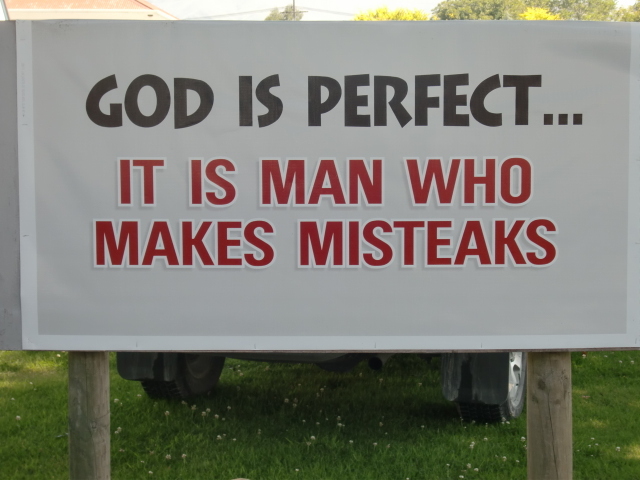 For him it will forever be a bit of unfinished business. 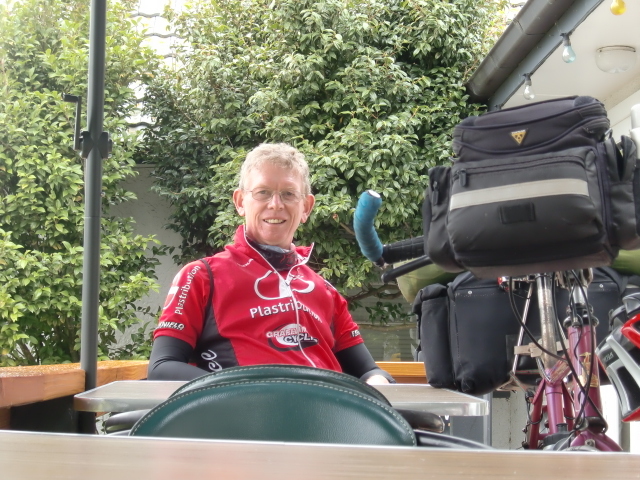 But it was good to meet up, share the ride back to Invercargill, and sit down over a leisurely lunch. 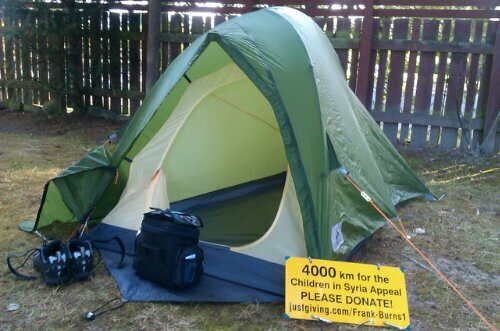 And thank you Steve for the generous donation to The Children InSyria Appeal! 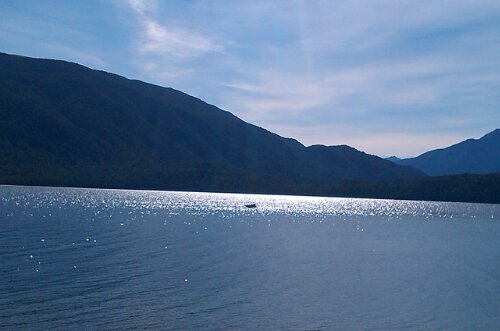 Like many off-shore islands. 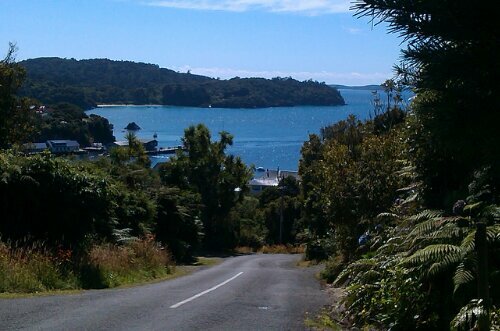 Stewart Island seems to have its own rhythm of life. Like St Mary’s in the Scillies, the centre of community life revolves around one small township, Oban, and the few roads that exist, radiate no more than 6km from the town centre. In other words, everything of importance should be within walking distance……but you would be amazed at the number of cars on the island. There is even a bus service, a bike hire business, and a car rental service!! but the quality was in the climbs and descents…sharp and unforgiving, but with ‘stop-in-your-tracks’ views over every crest. 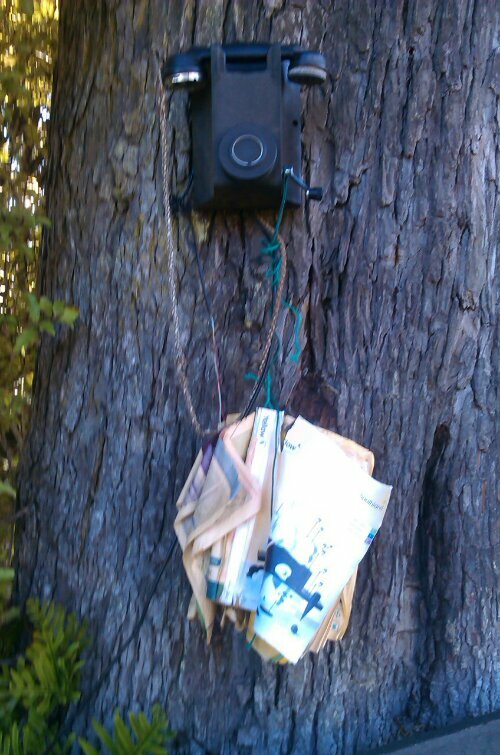 This is an old wind-up telephone from the 1920s, still seemingly functional, by the roadside. I tried calling the operator, but it must have been her lunch break……..
which is sending some species into a downward spiral. 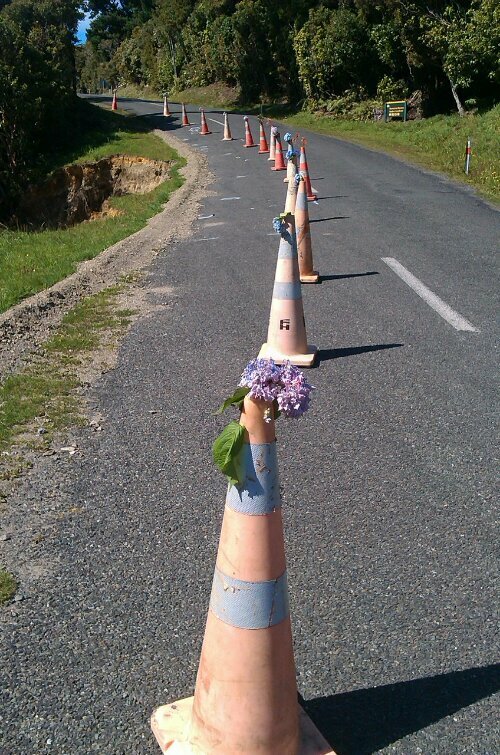 Flowers on road cones are an expression of solidarity with the people of Christchurch, who are remembering and commemorating the second anniversary of the earthquake that destroyed their city. 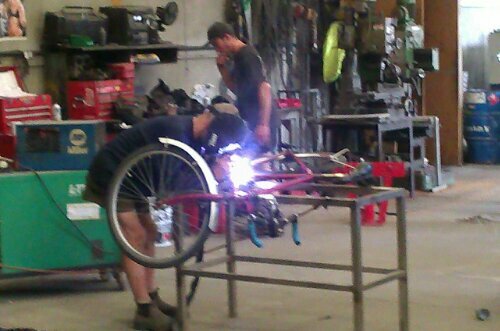 Tomorrow, back to Invercargill to prepare the bike for its flight to Sydney. Oz, here we come! No bluffing….this is the end! Invercargill is crawling with journalists. They jump out of the bushes and catch you when your guard is down. Then I discovered there is a school of journalism in the local Polytechnic, SIT (Southland Institute of Technology), and all the students are out there hungry for a good story. 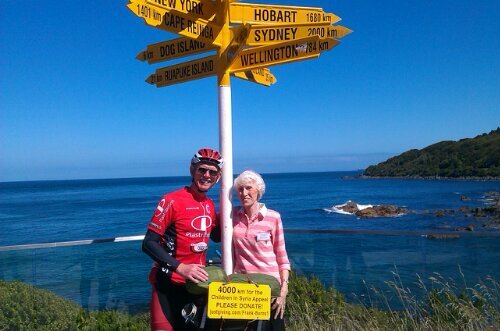 Before I set off to complete the final 30km to my destination, I had an appointment at the studios of Cue TV (www.cuetv.co.nz) where I was interviewed by Margot Sutherland, and then followed by a cameraman for some action shots on the road to Bluff. Didn’t know whether to wave at the camera or simply look as if I was suffering with the strenuous effort…… chose the latter ‘cos I didn’t want people to think I was actually enjoying myself! 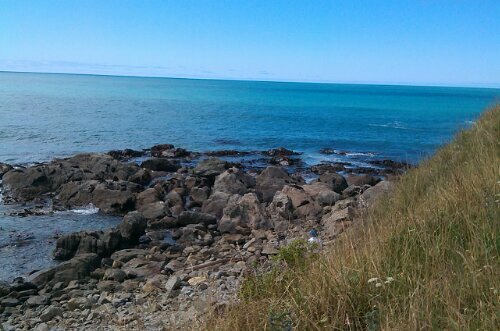 So I eventually get to Bluff (the Land’s End of NZ) expecting to quietly take a few photos and then disappear to Stewart Island. 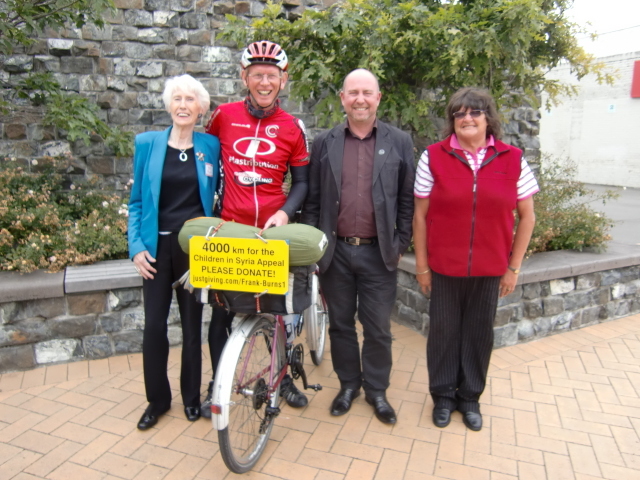 But no……my gracious hosts in Invercargill, Marie, Bryan and Cecily, had made the journey down to be my welcoming party, and to join the little celebration of my completion of the journey. No sooner had the ritual photos been taken, but another journalist jumped from behind a bush clasping his voice recorder. He was a radio presenter from MoreFM, he rattled off a number of questions for which (of course) I had well rehearsed answers, then he amiably questioned the distance I had covered. 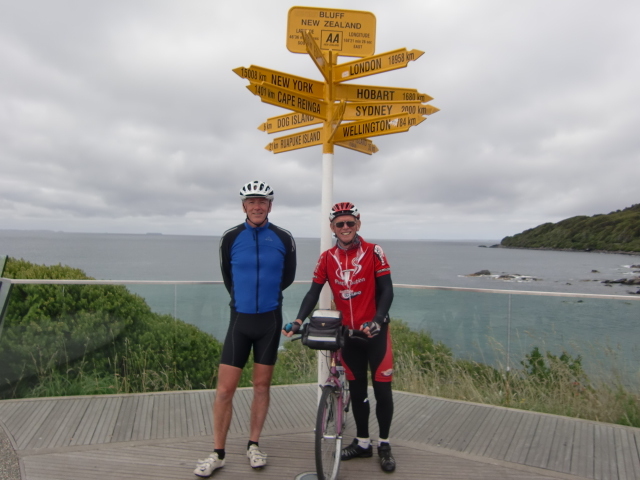 Unlike the sign on my bike, the signpost said that Cape Reinga was only 1400km away, not the nearly 3000km I had covered. 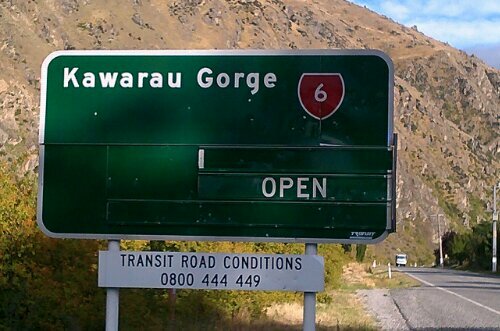 I politely pointed out that 1400km is as the crow flies, and that NZ roads were never designed for avian migration…….and anyway, why would anyone want to take the shortest route? For me, there were too many fascinating diversions. If you look carefully, you might see that London is over 18000km away……but again, that’s for the crows. But they generally don’t stop off in Singapore to re-fuel. 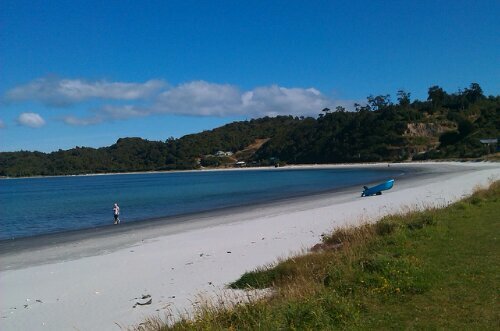 I am now on Stewart Island, a one hour high speed catamaran journey from the mainland, ready to spend 36 hours chilling out and eating a bit more of the above. 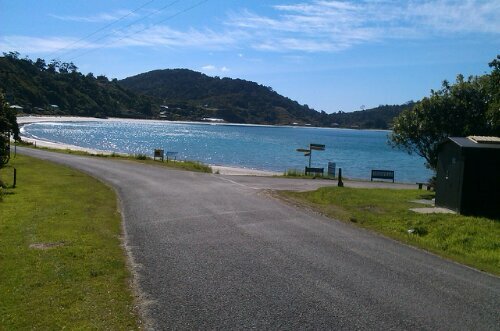 But let me finish with a few more examples of Kiwi generosity: a couple overtook me on the road to Bluff, pulled over and donated $10; a gentleman gave me another $10 as I was having photos taken beneath the signposts; on Stewart Island, as I was trying to negotiate a discount on my pitch for 2 nights, David (who was accompanying a group of deer hunters) stepped forward and paid my $40 bill as a donation. 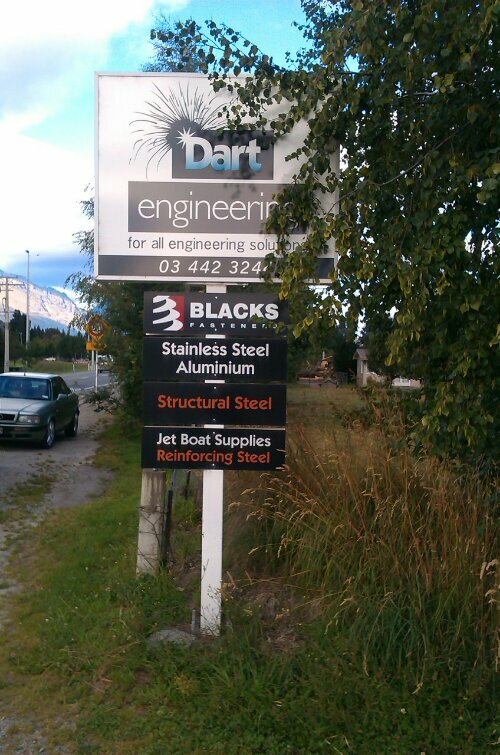 Only in New Zealand……….. When I get to Australia, I’ll tell all the Aussies just how generous the Kiwis have been……..and they’ll all be so hopping mad that their hands will inexplicably go deeper into their pockets and purses :0) Wouldn’t that be great for the Children in Syria Appeal? 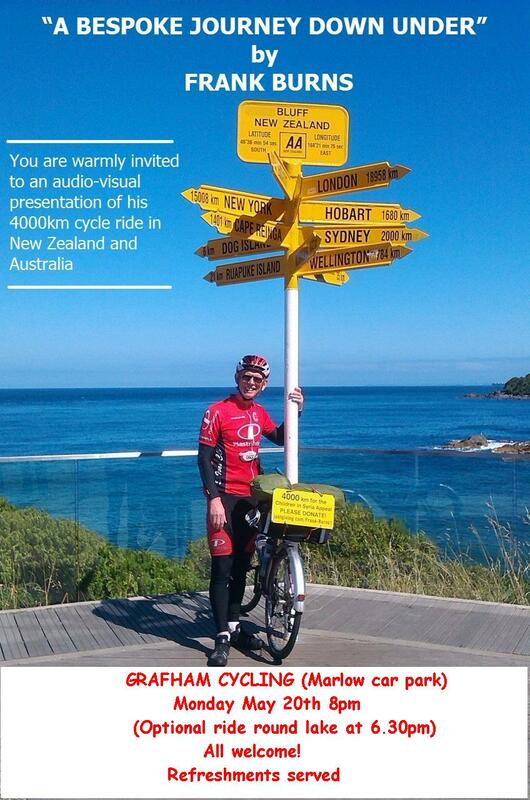 Calling all Sydneysiders, or people who know someone living in Sydney…….. 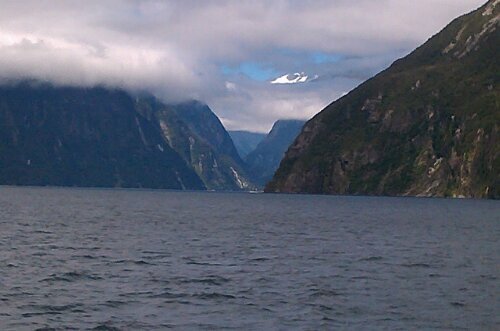 I will be arriving from NZ at 17.05 on Monday 25th. Any tips on getting from the airport to the city centre by bike, and a good economical place to stay near the centre, most welcome. I’ll be there for just 2 nights. Was I glad to have done the big mileage yesterday? You bet!! A gale sprang up in the night, hailing from the south, and so strong was it, I grumpily got out of my sleeping bag at some unspeakable time in the morning to secure the guy ropes and pegs……….but thanked my lucky stars that I didn’t have to cycle 90km (57 miles) with this gale as a headwind. the publicity shots……..and then it was time for a bit of lunch. 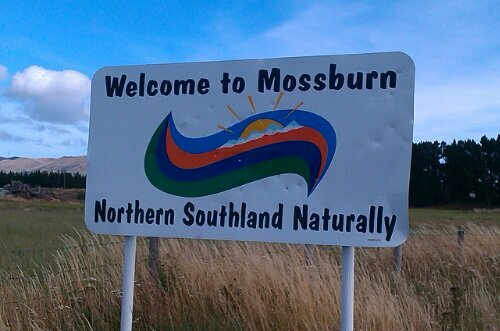 I am, indeed, very grateful to Marie Teuwen, President of Save the Children (Southland) for arranging the warm welcome, and to Cecily and John Mesman for offering to feed me and give me a bed for the night. rare, in fact, that they have to be “curated” in order to secure their continued existence in this world. 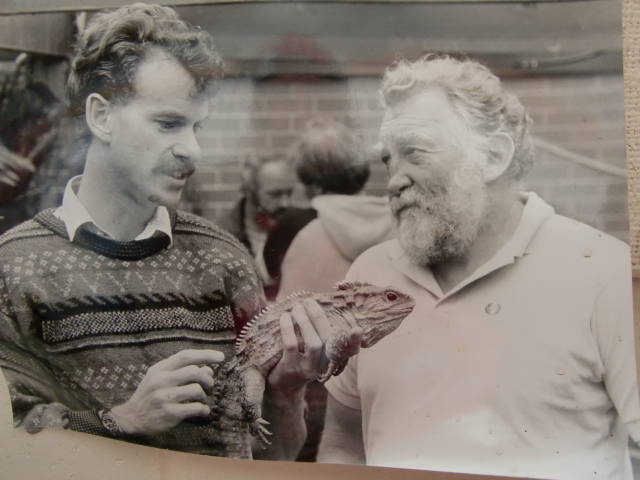 Lindsay has consorted with famous people in his field, and has also nurtured the existence of “Henry”, a 110 year old tuetara which has been noted to still have the ability to “wow the ladies” and perform……… Just imagine, Henry was born at the time of the death of Queen Victoria, and could feasibly see out two centuries on this planet. 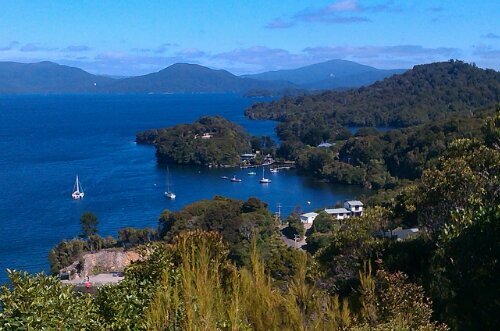 Tomorrow, I will make my way down to Bluff, take the customary photos beneath the signposts pointing to the four corners of the world, then jump on a ferry to go to Stewart Island, the most southerly inhabited landmass this side of the southern hemisphere. At that point, I will truly have finished my journey. 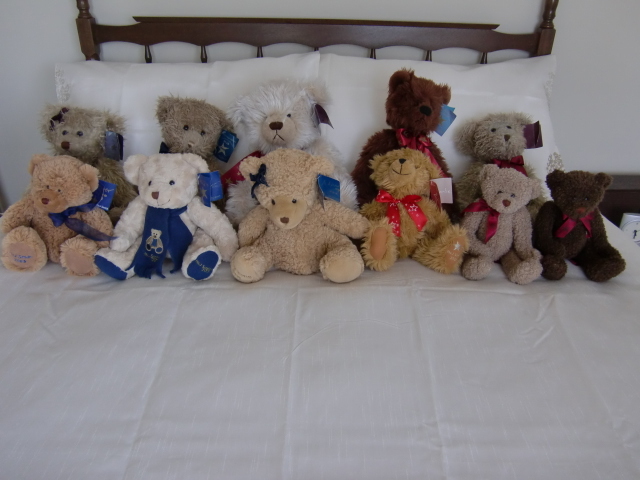 The family of bears that will be sharing my bedroom tonight! 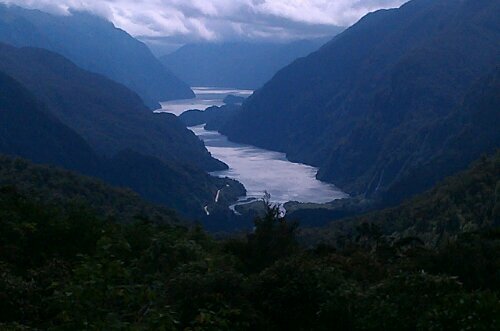 How did Doubtful Sound get its name? 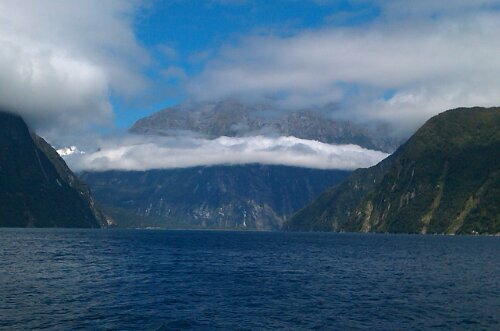 One Capt James Cook (from my home area in NE England) arrived at the west coast of S Island in 1773, studied the entrance of a fjord, wondered whether to enter, hesitated, and decided against. The dominant westerlies could keep him locked in for up to a month. 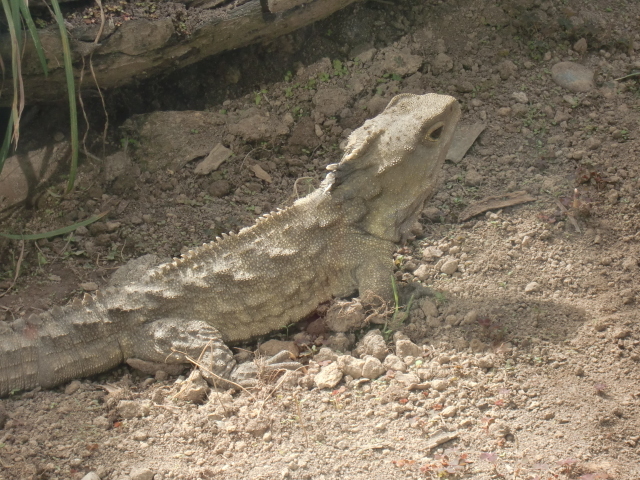 His hesitation made him ‘doubtful’….hence it’s name. 20 years later, along came the Spaniard Malaespinas, and they made the first entry in rowing boats, and began mapping the hydrography and the coastline. 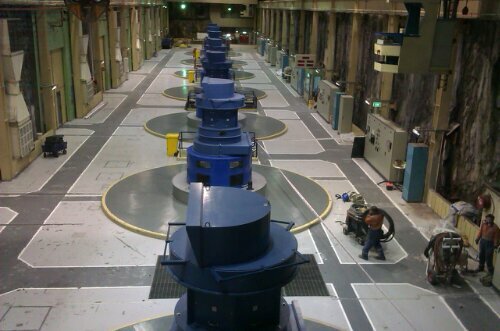 that can produce more than 800 megawatts of power. The story of its construction and the lives lost in the process was very moving. and the appalling statistics of rainfall: 8 metres in an average year, but in 2009 a massive (and hugely destructive) 16 metres of rain fell. To stir your visualisation of what this means: imagine the UK rainfall of 2012 x 12……..and you have some idea. 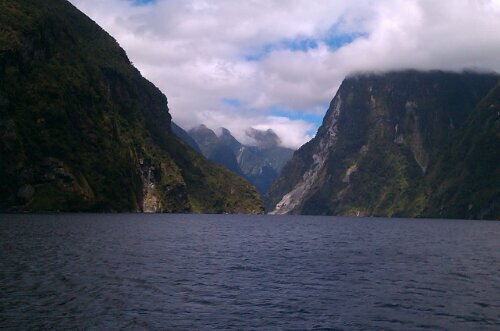 And to think we had another dry, sunny day for our trip today! It would seem I landed on my feet twice……which means for the rest of you, the odds are massively stacked against you. Sorry about that! But if you help the Children in Syria, your chances of a fine day in the Sounds is vastly improved…… believe me! Once called Milford Haven (because of Welsh connections), some say there is only a 10% chance that you’ll catch a fine day there. And guess what? 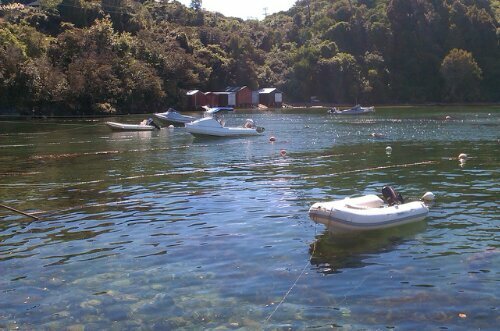 The Maori weather gods were on our side! 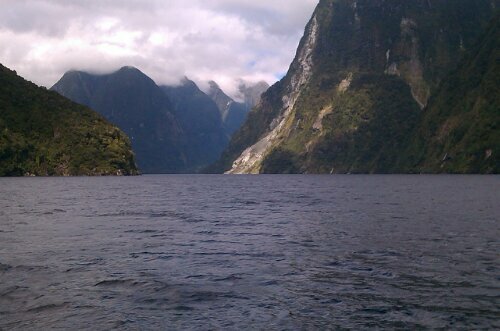 This place gets nearly 7 metres of rain per year. You may think that 2012 was a wet one for the UK, but that was less than a fifth of what the west coast of S Island can get on an annual basis. So if you have been a whinging Pom about last year’s weather, you obviously need to get things into perspective…..! 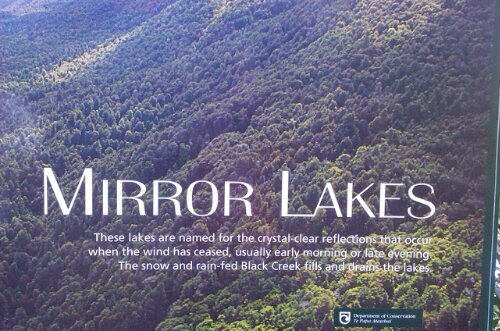 providing a framework for the soaring peaks. 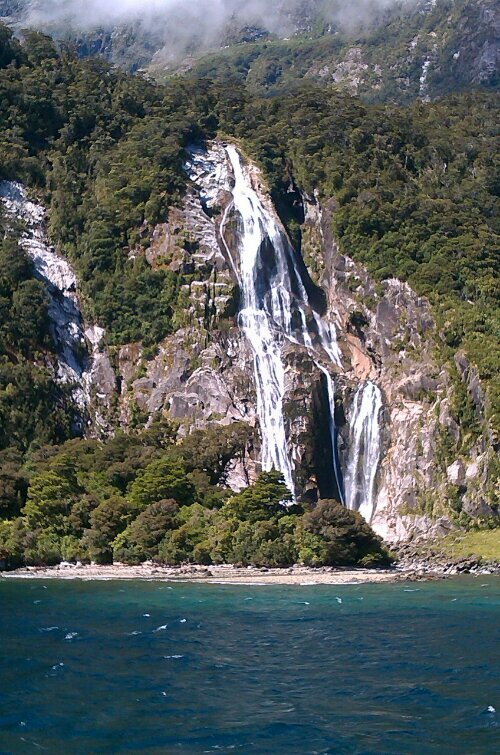 It’s remoteness is essentially a contributing factor to the conservation of such beauty, which proudly has the status of a World Heritage Site. 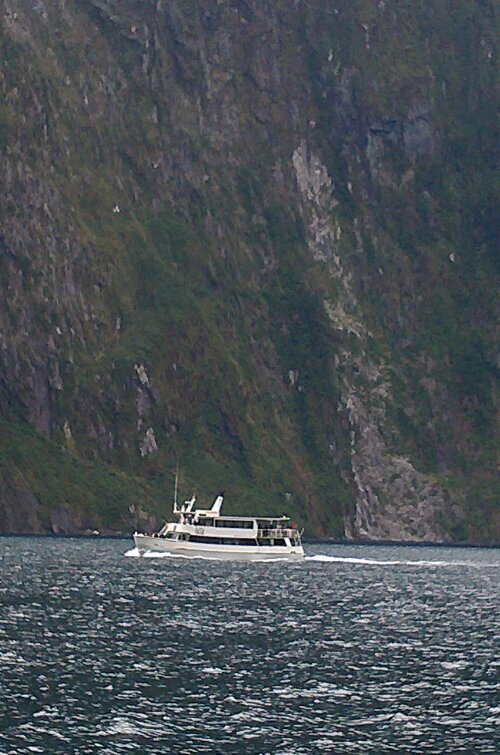 If you come this way, hail rain or shine, put Milford Sound on your itinerary. You will not be disappointed. 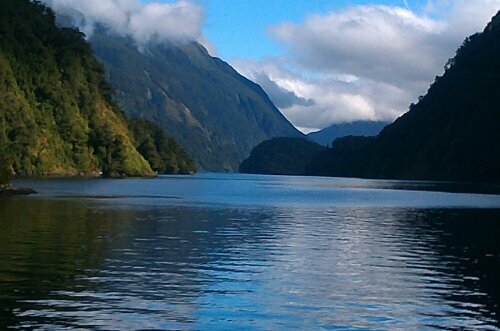 To conclude the day, I sped the 20km to Manapouri to put me in place for a trip out to Doubtful Sound, even more remote, and accessible only by boat. Nice to report a quiet day! Short on distance and almost lacking in hills and headwinds. 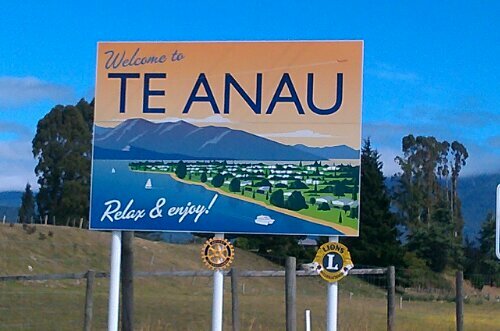 Te Anau is the gateway into Fiordland, the most remote and outrageously beautiful part of NZ. 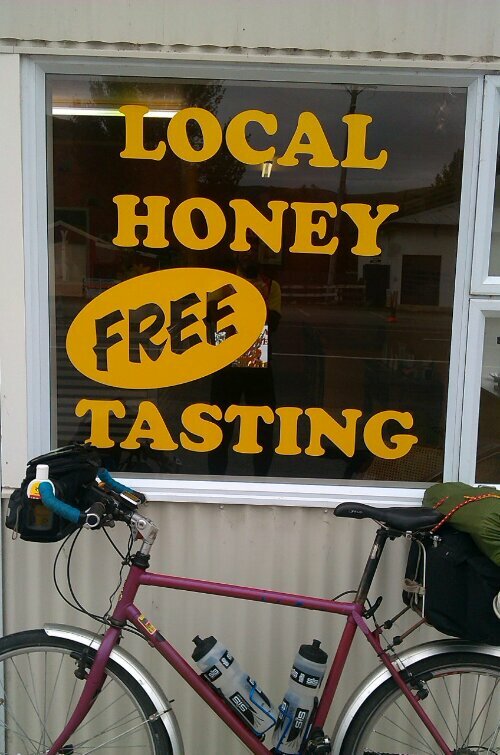 So it was never my intention simply to cycle past with ne’er a thought of lingering to gawp. 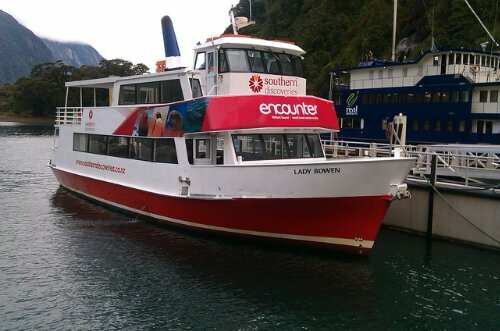 So folks, I am self-indulgently taking 2 days out to have coaches and cruise boats be my principal forms of transport, to take me to the very remote Milford and Doubtful Sounds. But beauty and remoteness come at a price: the infamous weather (6000mm of rain pa) and the dreaded sandflies (which would do an ‘Agincourt’ on the Scottish midges). However, the weather forecast is promising……. 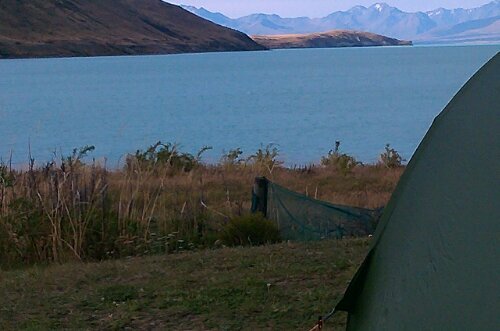 and my tent (on yet another donated pitch) has a view of some of the above. 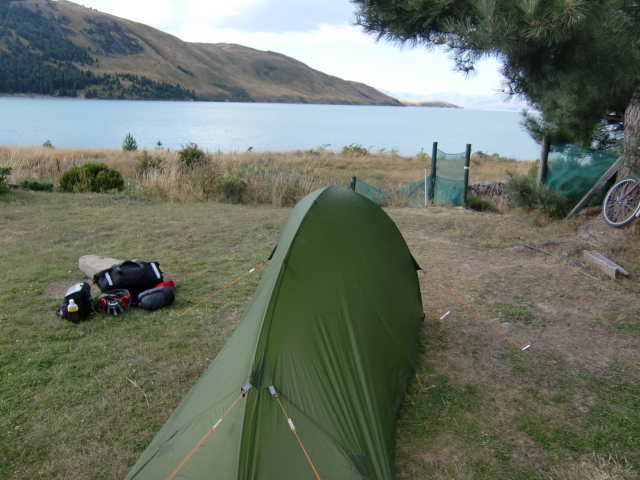 Sleeping in a tent no bigger than a Tesco’s plastic bag does have it’s compensations…..
we hugged each other farewell. 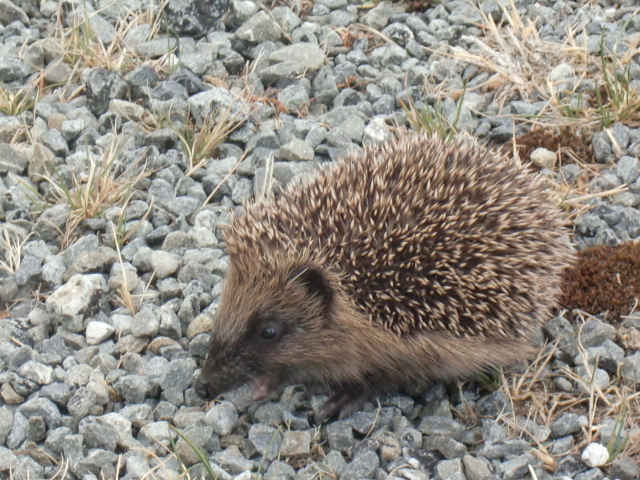 We were going in different directions, but sharing their company over the last 4 days has been very special. Bob has to fly home to hold the hand of his dying father, and it looks as if their homeward route through S America is now in jeopardy. But priorities are not in doubt. 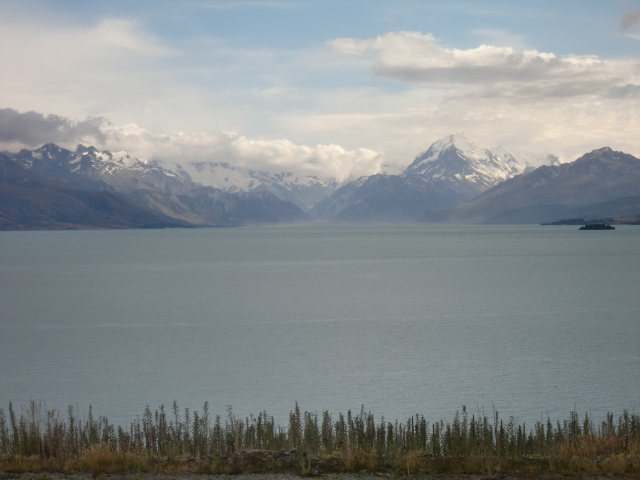 As I meandered along the edge of Lake Wakatipu, a truck towing a trailer pulled over in front of me, a hand waving me to slow down. Peter thrust $20 in my hand, said he would see me in Bluff, and that he knew a lot of people in the area. I am eagerly mystified! Oh and by the way, the bike behaved itself impeccably today, obviously fearing the ultimate sanction: that of being chucked on the scrap heap! 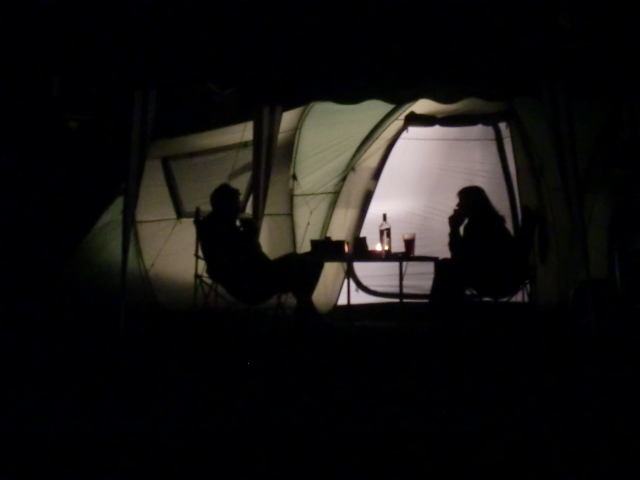 So I put up my tent in a quiet remote campsite with an easy mind……. Thank you to everyone who has generously donated to the Children in Syria Appeal. We keep hitting new targets as people continue to respond magnanimously to the cause. Now those of you who know about these things will understand that a severed lug on a bottom bracket is potentially a very dangerous thing. In other words, I am exceedingly happy (sitting by a public phone booth tapping into free WiFi) to be able to recount this story, because the outcome could have been very different. 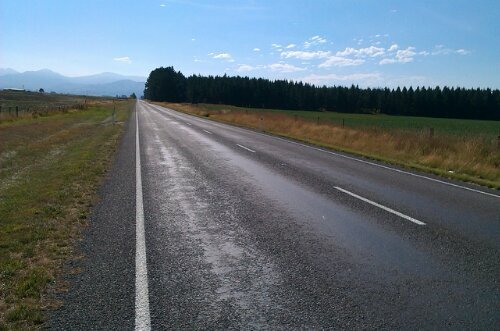 So the journey resumes tomorrow, not over a 110km rough gravel track as originally planned, but along state highways. 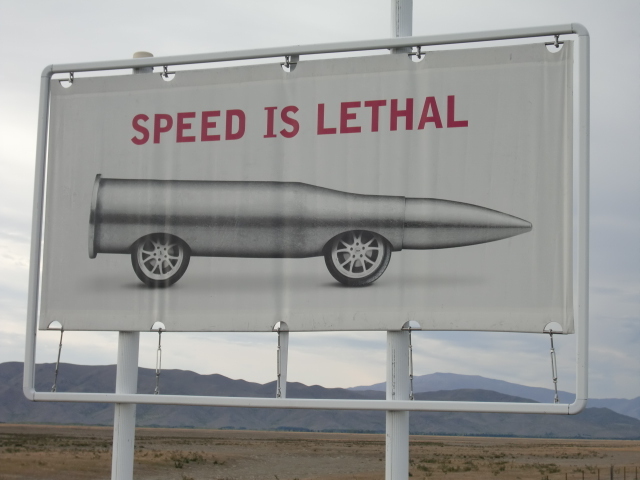 Don’t want to test that weld to the limit. 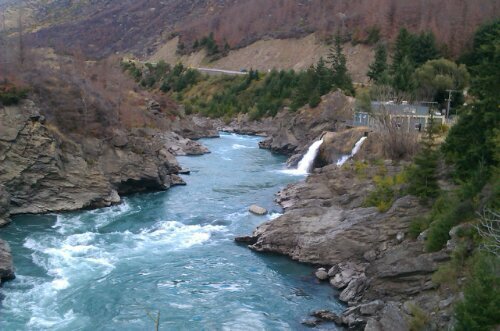 Having a day off the bike almost makes you prone to non-motion sickness, but at least Queenstown has been a place of considerable intrigue. All the adrenaline pumping activities can do serious damage to your economic health: imagine a 143 metre bungy jump that will set you back £140…..that’s £1 per metre! And some know-it-all physicist will tell how much per second…..
A full day of scenic flights and lake cruise will say adios to £600. 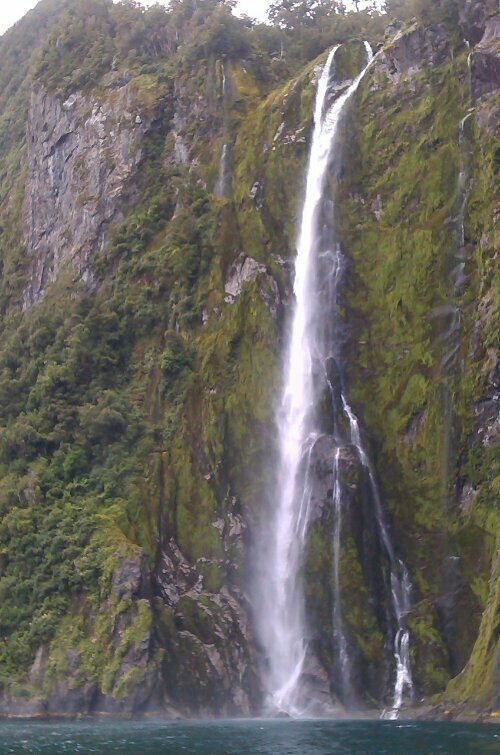 The Kiwis know exactly how to seduce people to part with stashes of cash. Talking of cash, I want it to be known at the highest levels of linguistic endeavour that I have coined a new expression in the English language: “the drive-by donation”. 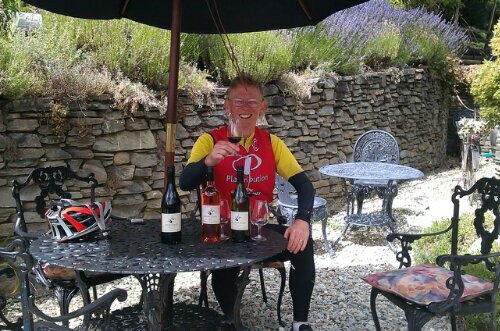 I have become so adept at receiving donations from passing motorists, that I am considering becoming Wiggo’s (sorry, Sir Brad’s) personal domestique in the Tour de France…..just so I can go and fetch his bottle from the team car (and have a little illegal tow to boot!). Long journeys have their moments and their mishaps. I am happy to be sitting in MacD’s using their free wifi, and being able to tell you this story. 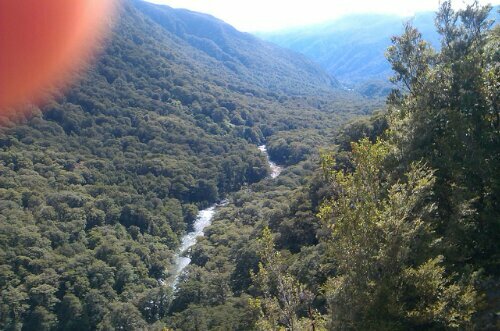 The day started with a dramatic descent of this gorge, that went on for 30km. 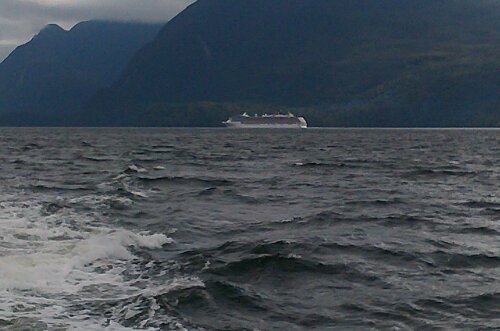 The views were totally distracting…. 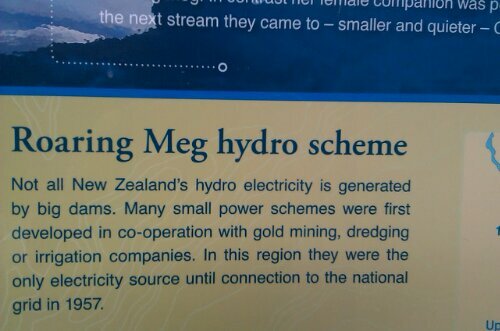 and when I stopped at the Roaring Meg hydro station, 2 people spontaneously gave me donations. 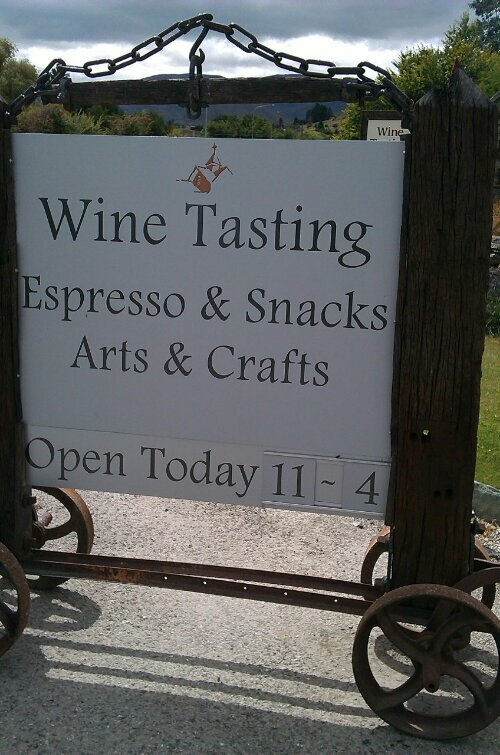 ….but of course they were only sample tastings……. When I came away from the vineyard, I noticed the gears weren’t changing smoothly, but I couldn’t identify the problem. 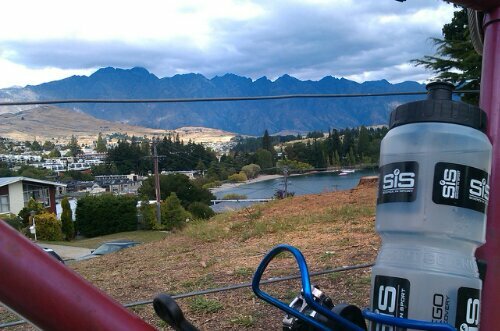 I limped into Queenstown, and into a bike shop, and they told me I was dreaming…..nothing wrong with the gears. 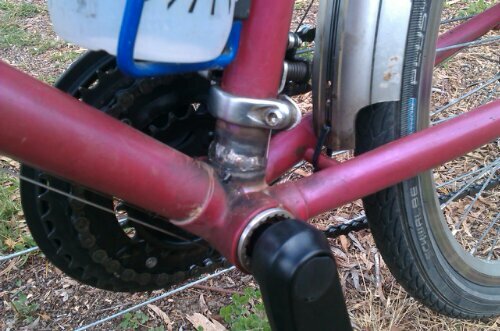 Then suddenly one of the mechanics spotted something that could have been life-changing (for me that is)….there was a terminal crack in the frame on the bottom bracket. 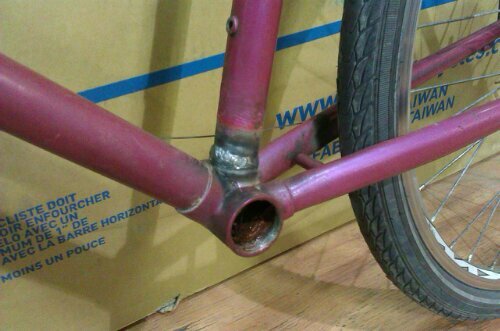 Except, of course, my 20yr old Raleigh Apex is made of steel…..which means it can be welded and repaired by any competent engineer. So that is the plan tomorrow…..an enforced rest day but an opportunity to put my much-loved elderly Raleigh back on the road. 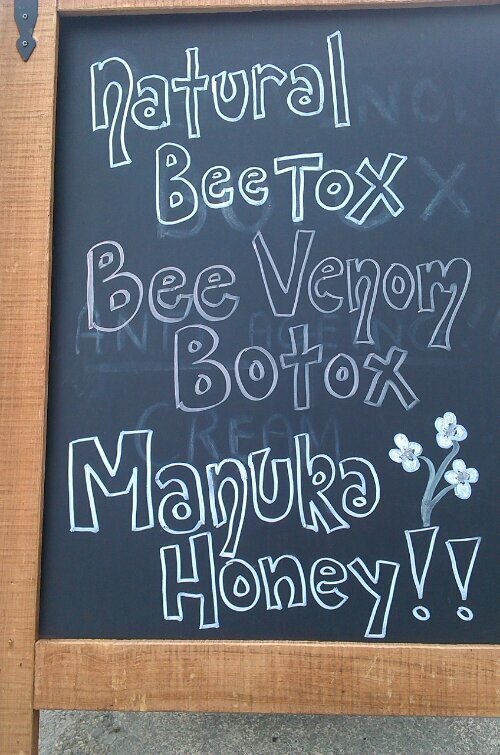 Maybe there is a message for life in this……..don’t push aging machines beyond their use- by date. Something to think about. A flood of road companions! A day to share with travelling companions! When I do solo expeditions like this, I expect to spend long lonely hours on the saddle, but fortunately I am happy with my own company, always fully occupied with inconsequential thoughts. 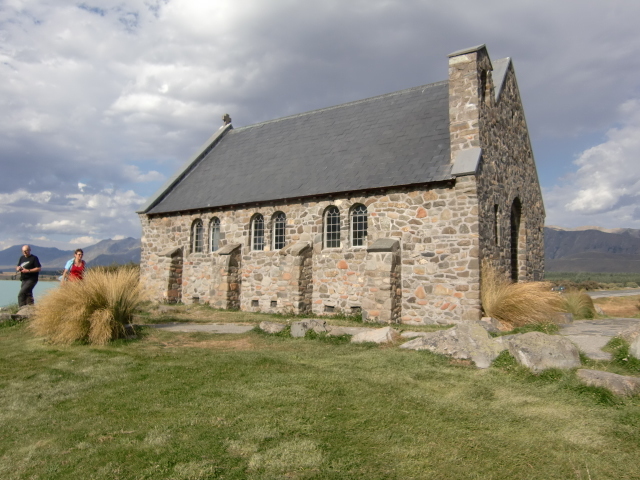 But today was different…..
During the long approach to the famous Lindis Pass (965 metres) I teamed up with the ABC family (Anna, Bob and Christine) and we helped each other with draughting. 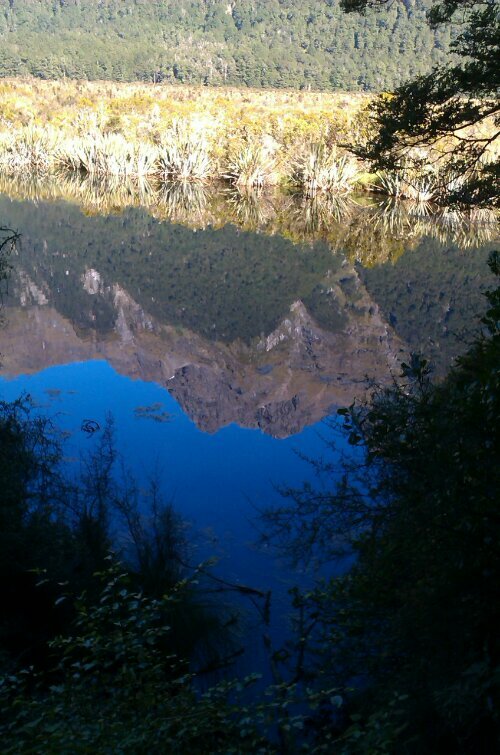 When the climb reared upwards, I found myself breaking away and then…….from nowhere, some large insect (probably a bee) struck me in the face and within a few minutes my lips and cheek began to swell up. The numb feeling was akin to what you get in the dentist’s chair, awaiting a deep filling or extraction. 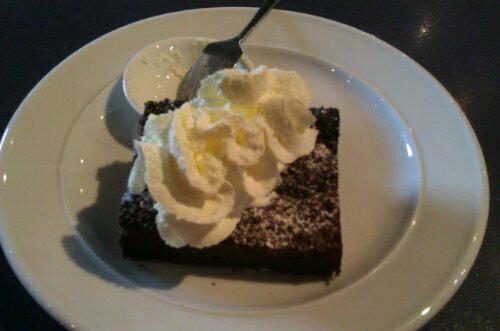 An hour later, I could feel it disappearing. Over the top, down the other side………….and blast! 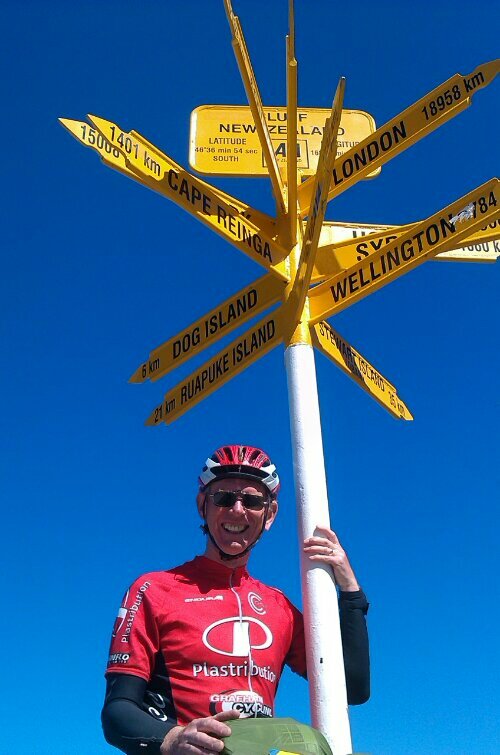 that headwind coming from the south was still with us……which meant pedalling again just to go downhill! 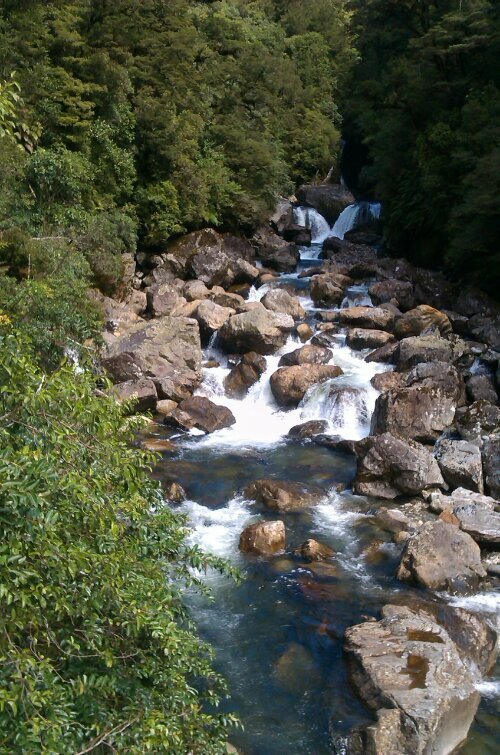 It was that sweet Mother Nature again…………….. 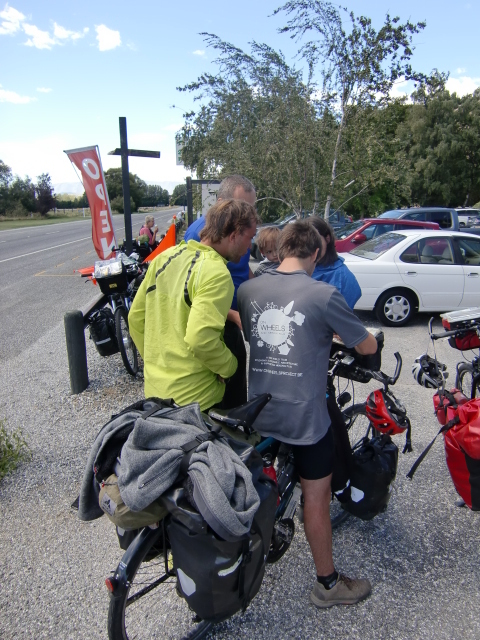 The first settlement in over 50 miles was Tarras, and a little congregation of cyclists was beginning to form, sharing stories of the road, and giving tips about the route ahead. 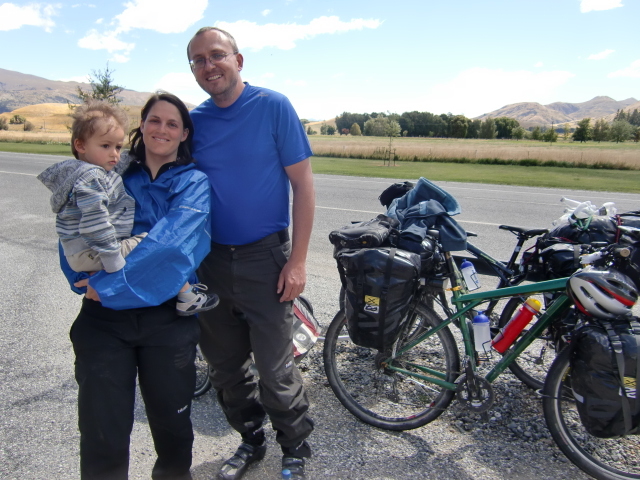 One Czech family of three were cycling South Island with their little boy of only 18 months! 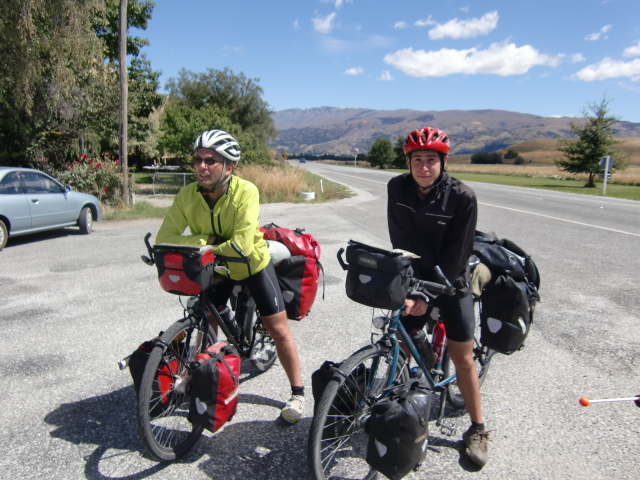 Two lads from Belgium were taking a year off to cycle the world. 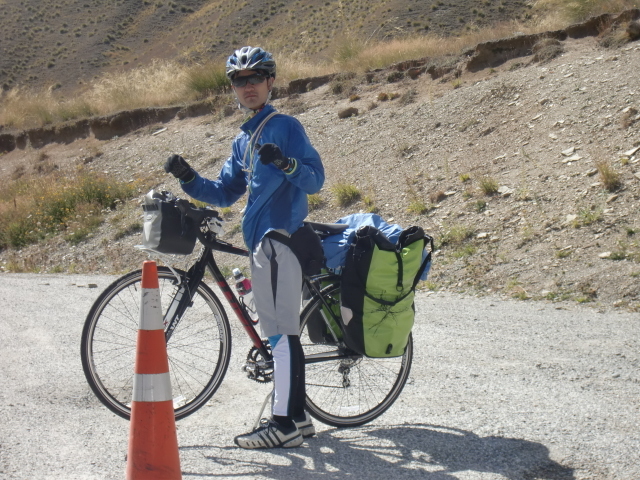 A young Japanese lad, with little knowledge of English, was spending two weeks cycling between Christchurch and Queenstown. And, of course, my ABC friends were half way through their year’s journey through the continents of the world. Some of all this made my little journey seem small and limited. 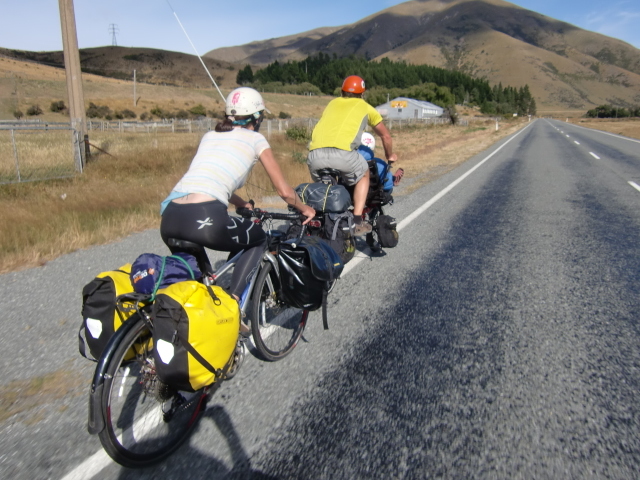 But the run down into Cromwell had us going full face into a strong southerly wind, and the only way to survive (with a smile) was to work as a team. And this we did. 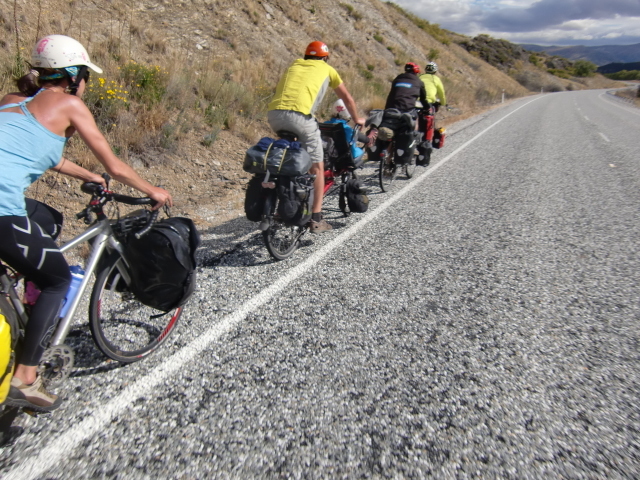 There is nothing to compare with the camaraderie of cyclists on the road. Wherever you are, there always seems to be a natural bond. The views on either side of the road were stunning, and the pace of the return journey along this 55km valley was unnervingly fast. Several of my hostel companions were being ‘coptered’ into the heart of the Alps to embark on multi-day mountain and glacial treks. There had been an atmosphere of eager anticipation when I left. 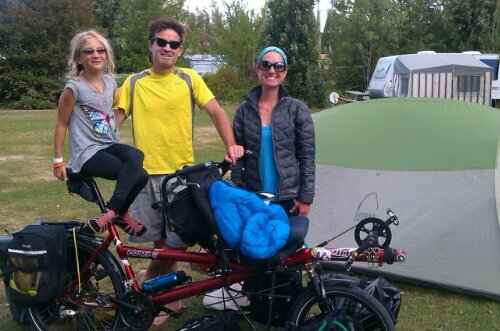 When I arrived at Omarama, and checked into another donated pitch at the campsite, I met up again with ABC…..Anna, Bob and Christina…an astonishing family from California halfway through their world cycling trip. 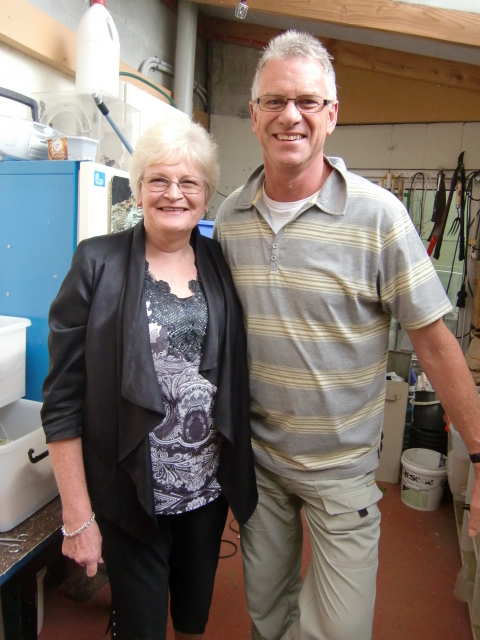 They have been through some struggles, faced several challenges, but are still thriving. I was particularly intrigued by their tandem, a Hase Pino, a German built design with a semi-recumbent front, ideal for 10 year old Anna. 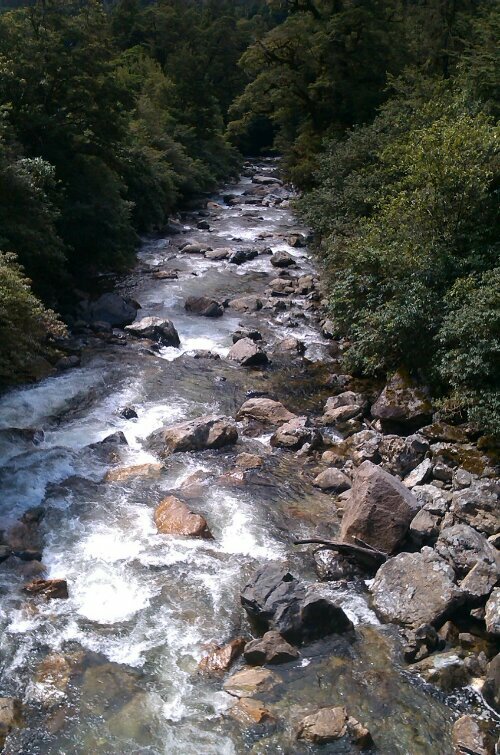 Tomorrow promises a climb to 1000 metres…….who would want to be on the flat anyway? Time for a good rant! Now that I have a full keyboard, this could be a 10,000 word diatribe on why we need to do more for the situation in Syria…..but I rest my case. I am, however, in the mood for a fulsome rant! 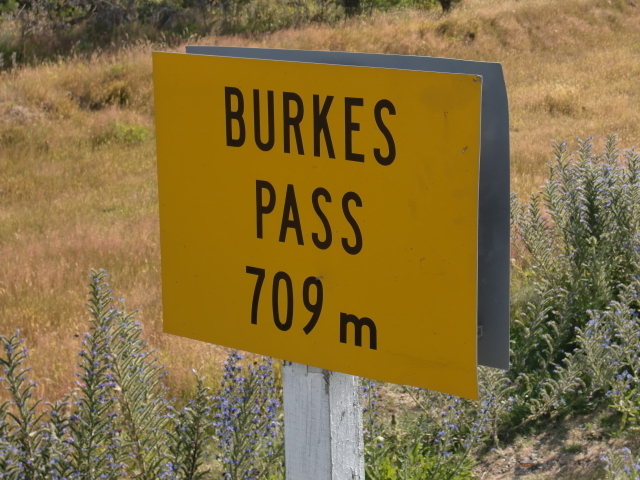 After yesterday’s debacle of a mere 90km route (just a normal day at the office) in excessive heat and a crossing of Burke’s Pass 709 metres (2200 ft), I fully anticipated that Mother Nature would reward me with a cool breeze at my back for my climb to Mt Cook Village. Well I’m afraid Mother Nature has a thoroughly evil side to her personality. It’s like moving house every day! (20-30mph) wind that was going to stay with me for the duration. 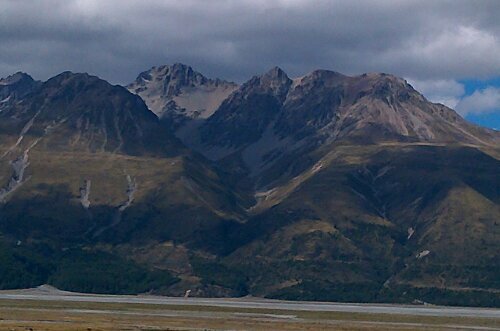 The climb to Mt Cook could be a very gentle (but long) rise to 700 metres. 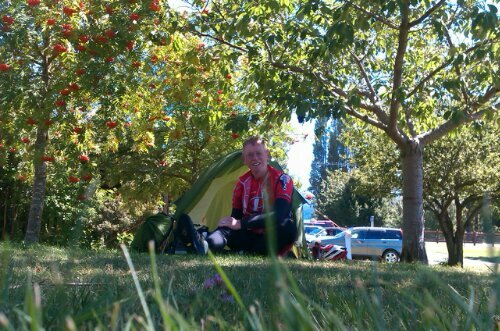 For 55km (35 miles) I was completely at the mercy of this head wind that was so strong that it brought me to a halt several times. 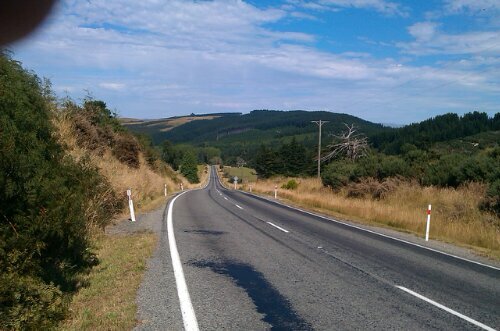 When you even have to pedal hard to go downhill just to achieve 15kph, you know you are in trouble. And I knew I was in trouble. 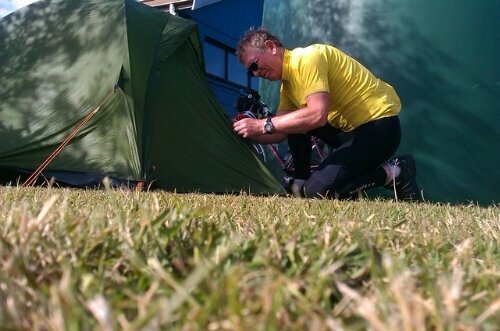 55km would normally take me no more than 2 hours…….today it was over 4 hours. I screamed to the elements, but Mother Nature was not listening………I have decided from now on to be her stroppiest teenager, and throw tantrums at the mere suggestion of not getting my own way in the future. ice axe-wielding rock climbers and mountaineers who do serious things up and down glaciers. I should fit in well. 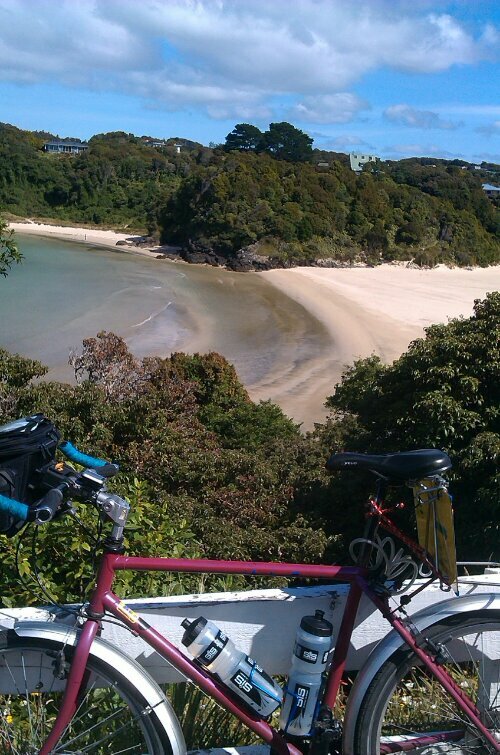 While I have your attention, a little anecdotal story: in Wellington I decided to replace my seat-post bolt (after 20 years service it was showing worrying signs of wear) so I went into a Giant cycle shop, only to be greeted by a broad Staffordshire accent saying:”Wow, a genuine Raleigh Apex in NZ. You probably bought it about 20 years ago, made of steel and sporting the (then) revolutionary Girvin Flexstem……..”. I realised immediately I had someone on my side, someone who liked his bikes and had fond memories of well-built bikes of yesteryear. 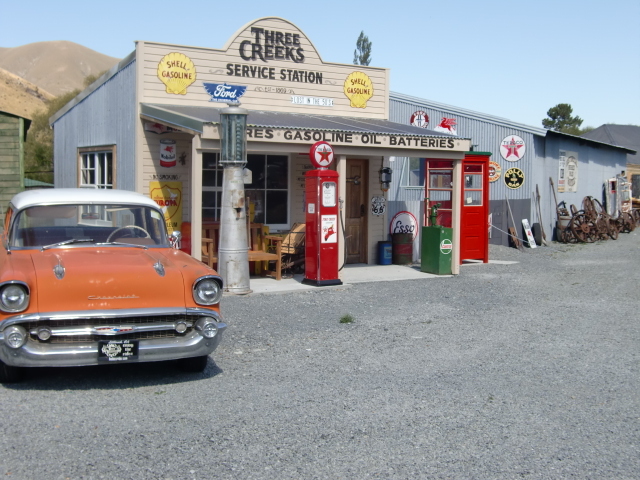 He simply stood there admiring it until…….I told him why I’d come into his shop. 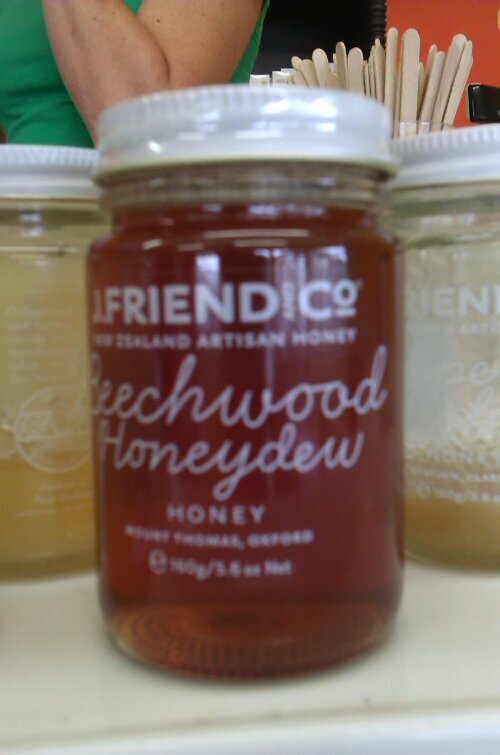 And still while I have your attention: I never realised so many Kiwis were so UK oriented. They know far more about the royal family than I do (which doesn’t say much) and they can quote names, places and events with an uncanny ease. When someone asked me if I followed “Corry”, my silence gave me away completely. What on earth is “Corry” I asked. “Coronation St, of course!”. I quickly realised that some Kiwis follow these soaps thinking they are a genuine reflection of the British way of life. I wonder what Mancunians think of that? 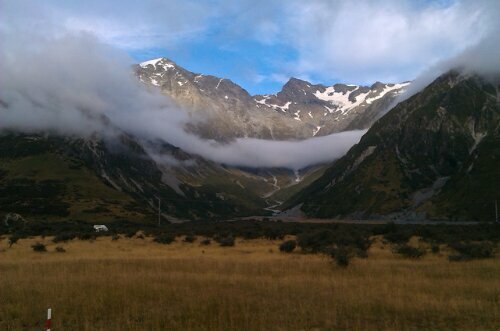 All going well (with Mother Nature’s consent, of course) the NW wind will continue blowing, and will blow me all the way back down the valley. I await with bated breath! Hot, hot, hot…..how can it be this hot in February? 30+C…..hottest day of the ride do far. 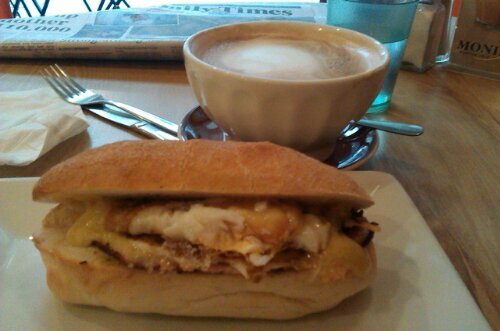 I was too complacent this morning, chatting to everyone as they passed at breakfast. I paid the price for a 10am start. 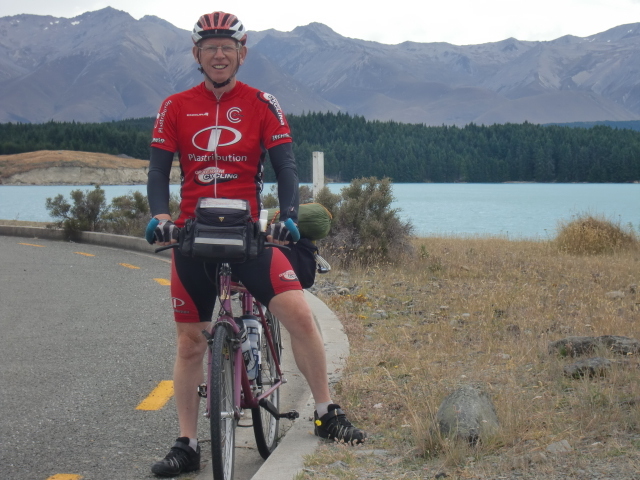 My 90km ride to Lake Tekapo should have been relatively straightforward, but the heat kicked in early……and there were mountains to climb. 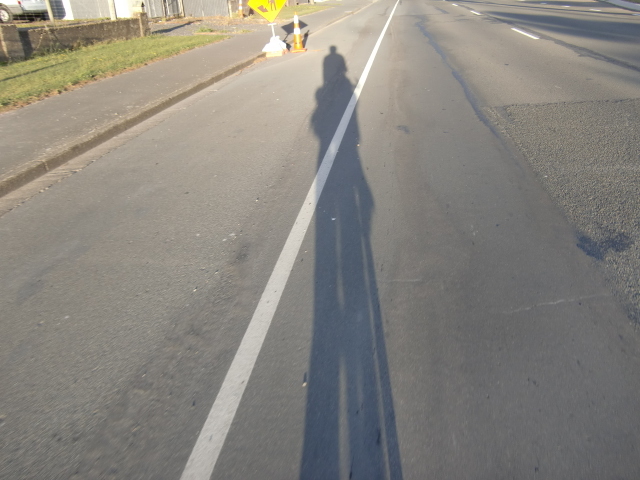 The roads seemed to broaden out….but that was the effect of less traffic. I was soon stripping off layers…. 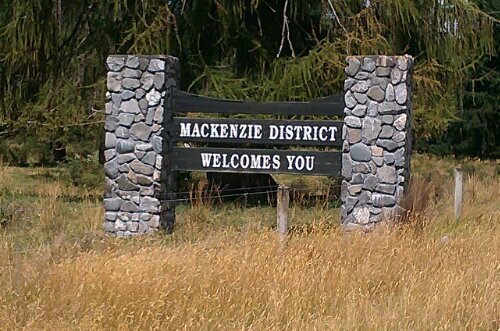 Then I entered deeply onto Mackenzie country, only to discover that Mackenzie had not been a Governor General of NZ but had been a mere sheep rustler! 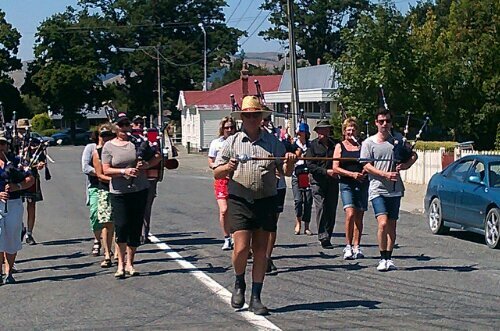 In Fairlie, taking a break from the appalling heat, my siesta was disturbed by the Mackenzie Marching Pipe Band, rehearsing for an upcoming competition in Timaru. The south part of S Island is a bit of Scotland in exile. 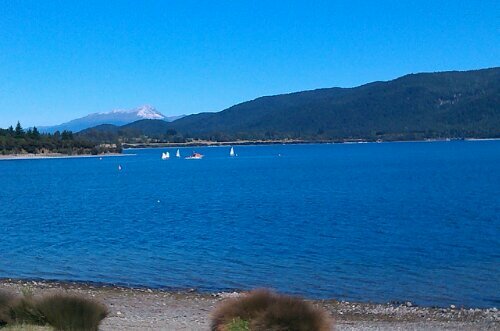 And as I finger-type this on my little phone, this is the view I have of Lake Tekapo. 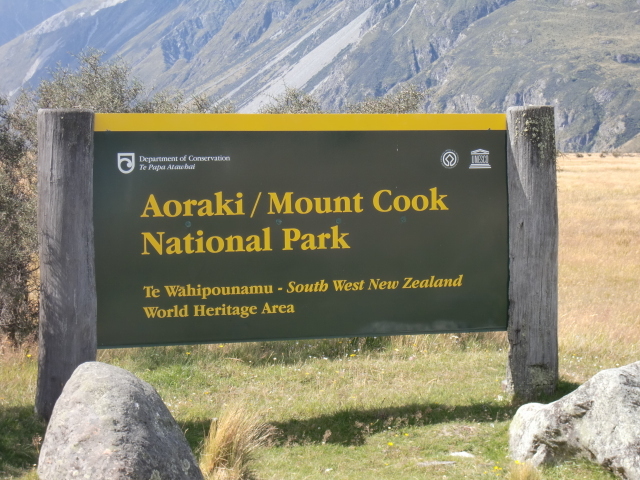 With a favourable wind and cooler temperatures, tomorrow I will climb the 103km to the village of Mt Cook, which cowers beneath the 3750mt summit of the highest mountain in NZ. Wish me luck! And a note to Steve: where are you? We need to GPS each other! 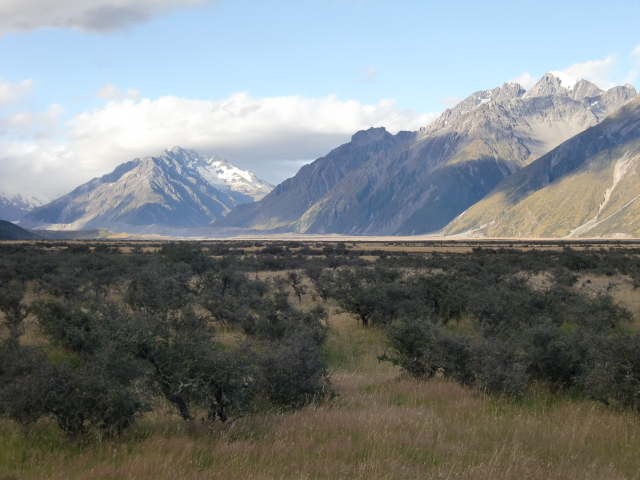 120km across the flat lands of Mackenzie country brought me to the foothills of the Southern Alps, with the mighty Mt Cook in the background. 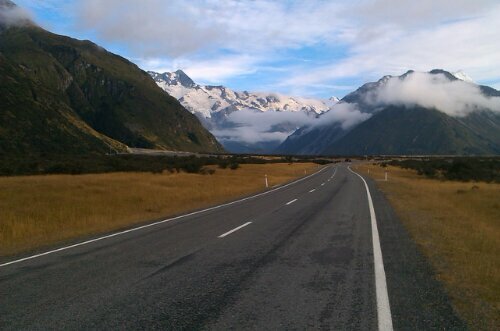 South Island has fewer than a million inhabitants, so the roads are delightfully quieter. This means the distances between feeding stations are ever greater, but this slab of hummingbird cake put a few miles back into the legs! 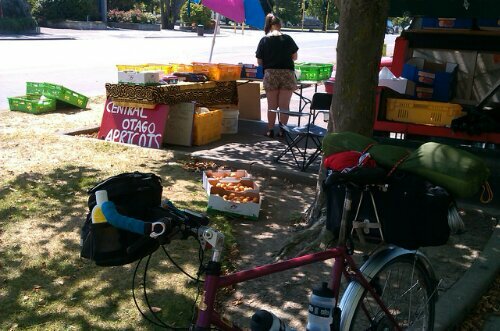 This roadside fruit stall waylaid me….couldn!t resist the apricots from Otago. 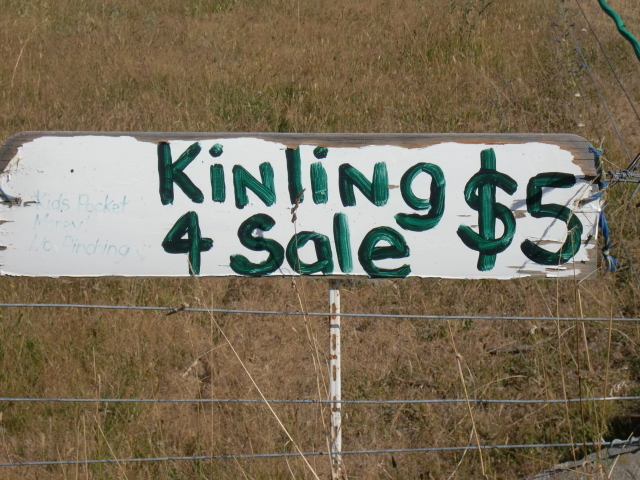 And when I checked in at the Kiwi Holiday Park in Geraldine, Lindsay (the warden) kindly donated the cost of my pitch. 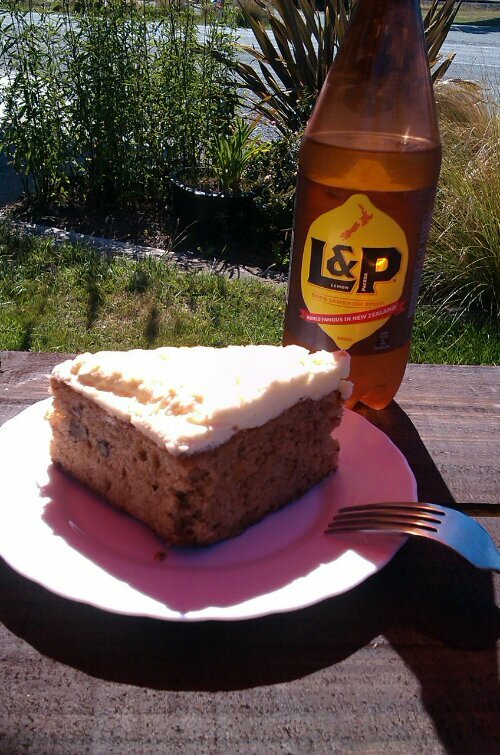 Yet another example of Kiwi kindness. Significant donation today: a lady called Stacey approached me in a service station and contributed $20. I am touched by people’s trust and their spontaneity. 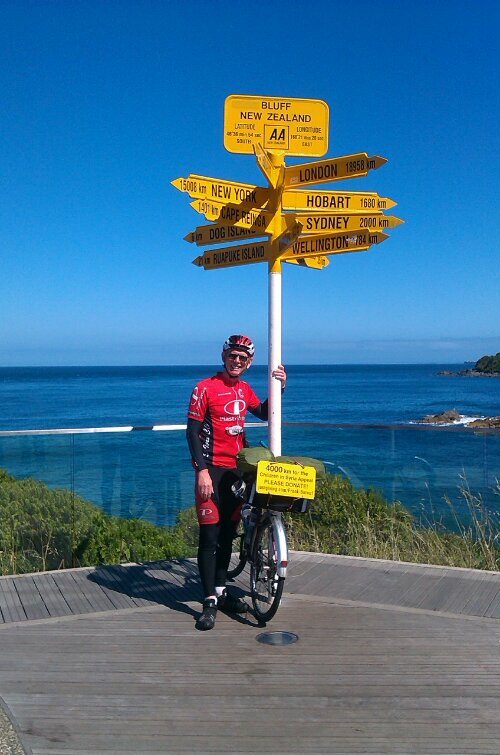 Footnote: Steve Wesson has begun the chase from Cape Reinga. 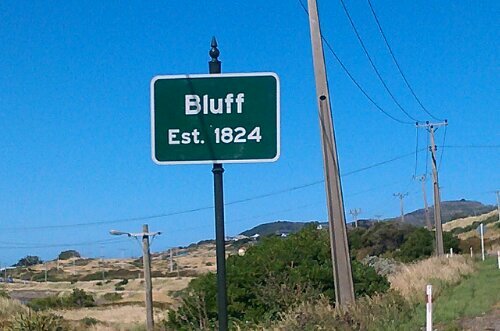 We hope to shake hands and have a beer or three at Bluff……..but he needs to get on his bike and pound the tarmac. I’m about 1500km ahead of him. See you in Antarctica, Steve!